The sparks feature in Google+ helps you to find content and spark new ideas that you can share with your friends on Google+. After you add a few sparks to your page, you’ll want to start using them. To read a spark, click the spark in the left-hand column of Google+. Immediately a stream of results will appear related to that spark on Google+. Sparks gets its content from Google search results. If you want your content to appear on the Sparks stream, be sure you’re exercising proper search engine optimization (SEO) techniques! Read them! Click the link of any spark to read the spark on the website that the spark links to. Vote on them. Click the +1 button directly beneath the spark to show your interest. The number of +1s indicates the popularity of the spark, which gives you one way to decide whether a spark is worth reading. Share them with friends. 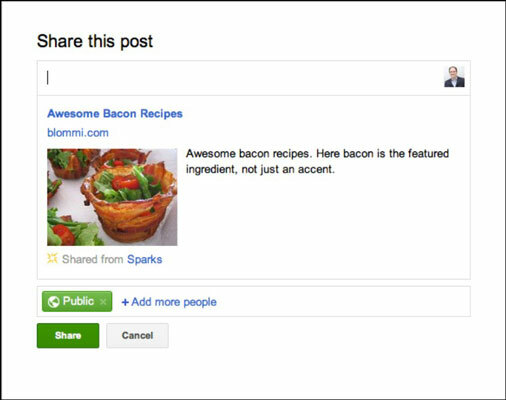 To share a spark with friends, click the Share link and a Share dialog box pops up, similar to what you would see if you were sharing on your Google+ stream (see the figure below). Add a comment that will appear with the spark. Select the circle(s) or people you want to share with and click Share. The spark will now appear in your Google+ stream with all your other content! Clicking the Share button in Google+ invokes this dialog box. Sparks is a pretty simple tool that makes it easy to share content. It is currently available only via the web interface and not in any mobile app. Sparks is likely to improve over time, so pay attention to see whether Google+ adds anything new to this feature down the road.